Julia Ross (Nina Foch, An American in Paris) in an American woman living in London, England, who answers a lady’s (Dame May Whitty, Mrs. Miniver) newspaper ad for a personal secretary. After a quick interview, Julia is hired on the spot, but she is unaware that her new employer isn’t the nice elderly lady she pretends to be. This cheap, unpretentious Columbia Pictures programmer is surprisingly crafty and suspenseful. Crisp direction, good performances and an interesting storyline help create an engaging viewing experience — My Name Is Julia Ross is a rock-solid, better-than-you-might-expect B-movie. The film was directed by Joseph H. Lewis, who demonstrated to have a knack for making gold out of pyrite all throughout his career. Lewis made dozens of great B-movies and some of them — film noir classics Gun Crazy and The Big Combo come to mind — have better reputations than many contemporary A-class movies. 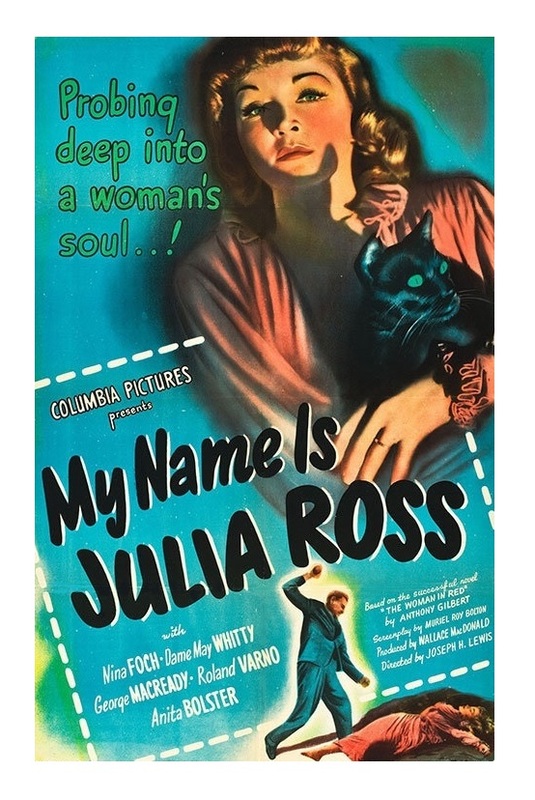 My Name Is Julia Ross is a typical Lewis movie: small-scale production filled with unexpected goodies. The economical script, based upon Anthony Gilbert’s 1941 novel The Woman in Red, was written by Muriel Roy Bolton (The Amazing Mr. X). The movie is tightly edited, wasting no time at all, and the plot, while a bit far-fetched, keeps you engaged. Deliberately or not, the film also works as a subtle critique of how women’s feelings tend to be devalued. Julia’s predicament can be attributed at least in part to the fact that an emotional woman is often dismissed as being hysterical. This idea of a powerless woman being “gas-lighted” adds another interesting layer to the film. Nina Foch is excellent in the leading role. 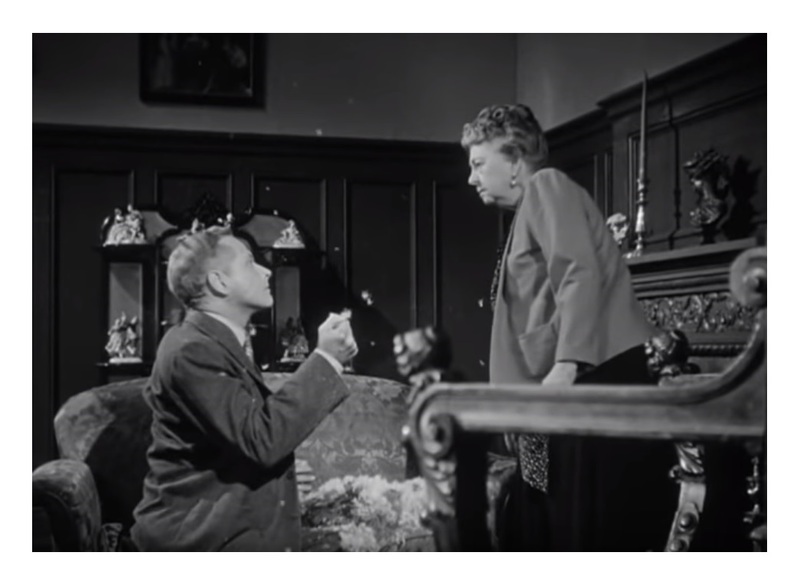 Dame May Whitty steals the show, though. Because Whitty is known for playing cantankerous, but lovable grand dames, it’s rather unsettling to see her play such a nasty woman. George Macready (Paths of Glory), who plays Whitty’s psychotic son, is scary too — the guy is completely nuts! The key word here is “Joseph H. Lewis.” He’s one of my favorite filmmakers and this is one of his most accessible films. My Name Is Julia Ross is very, very short, so even if you don’t particularly care for it, you won’t feel you wasted a lot of time. I do have a hunch that most fans of mysteries will enjoy it. Arthur Penn’s 1987 thriller Dead of Winter is a remake of this movie. B&W, 65 minutes, Not Rated. A superb low-budget film by a superb director. I recently watched “The Big Combo” for the first time – another Lewis gem! Combo is great! I also love Invisible Ghost (1941), one of my favorite Monogram films! Lugosi’s best Monogram feature IMHO. Have you seen the remake, Dead of Winter? It’s a pretty decent ’80s thriller. No I haven’t seen or even heard of it. Roddy McDowall always a winner. Simular poster to “In Cold Blood”. Added to the watch list. Sounds good.